"Just a note to thank you for your quick response to our dilemma last week. Your folks were very friendly and courteous on such a bad miserable day. They communicated so well. I know customer service and you & your company are experts!" "Just a quick note to say thanks for fixing our well. The test results are back and everything is back to normal. Thanks for the hard work and economical fix"
"Thank you so much for taking the time to explain everything to me and for assessing our problem and giving us the ability to make an educated decision. The other estimate we had received was really based on nothing. They were unable to even tell as how deep the well was. You guys know your stuff! Thanks again." "Thank you so much. I’ve never appreciated a shower as much in my life as this morning!" "There are not many times when I feel good about paying a bill, but that is certainly the case with this one. To begin with, you gave me very good advice prior to drilling. The drilling crew was in and out of here very efficiently. I hope the remaining [construction] tasks go as smoothly. Thank you for orchestrating a very nice installation." "I just wanted you to know that I am very pleased with the level of service you provided and your professionalism regarding our [water expansion] tank installation. You can learn a lot about a person by how they handle problems when things don’t go according to plan and this was especially true when you brought in an electrical contractor to correct the existing electrical system and get our water system up and running. Thanks for your great work!" 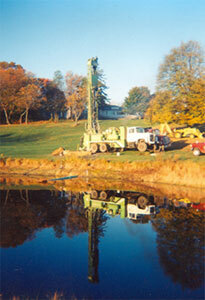 "Thank you very much for your quality installation of our new well. We really appreciated how quickly you and your guys took care of us." "I want to take this opportunity to thank you for the excellent service provided earlier this month when my water well went dry. Your service was very prompt (virtually immediate), everything was thoroughly explained, you took care of all the details, and your charges were exactly as stated – no surprises. Your hard-working crew, from my observation, did not even stop for coffee or lunch breaks, and was polite and responsive to any questions I had. Most importantly, however, your services were provided in a pleasant, amiable, and friendly manner, a rarity these days. And, you found us a good supply of water – something I now understand does not always happen." "Thank you for your courteous service. Your work last week showed an impressive display of water. I could never have gotten my old well pump out water like that for even ½ hour without going dry. I look forward to having this great amount of water. It will be a new experience. Thanks for all your help." "Many thanks for taking care of my thirty-one year old well gone dry that had resulted in adding another ten years to my life! I will never forget that smile on a nice gentleman knocking at my door what seemed an eternity later, He brought good news, “We found water [in the new well].” To see a gush of water piercing that gloomy overcast sky on October 22 (9:45am), brought joyful tears to my eyes. What a sight! Thank you, everyone, for a task well done. You are all professionals. I am truly appreciative for the flowing waters and most grateful indeed to have such a great team tend my well. How professional of you all to leave my yard so neat after you left."